This wonderful combination of blue topaz and white diamonds, all surrounded by decorative white gold, is a match made in heaven. The 8 mm Heart-Shape Blue Topaz and Diamond Necklace in 10K White Gold is a sparkling delight that will garner much attention, especially when worn under the lights where it will shimmer and shine in all its glory. This lovely necklace is an elegant mix of fine gems cast in 10K white gold. 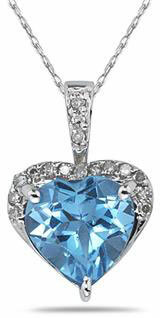 The pendant features a heart-shaped blue topaz (8 x 8 mm, 2.25 ct.) with graceful tones of blue and white that complement the round-cut white diamonds (0.08 t.c.w. ), all framed by an ornate gold heart. This double-heart design holds a message of true love and is the perfect gift to show you care. A pendant with a center stone as extraordinary as this heart-shaped topaz is really something to be admired and presented to a very special person. We guarantee our 8mm Heart-Shape Blue Topaz & Diamond Necklace, 10K White Gold to be high quality, authentic jewelry, as described above.